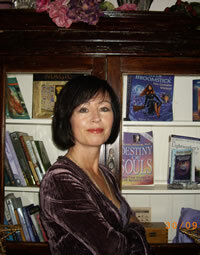 Querant has chosen The Page of Cups because she sees her self as young, loving and sensitive. She also says she can get quite emotional at times and does not like to hurt people’s feeling. 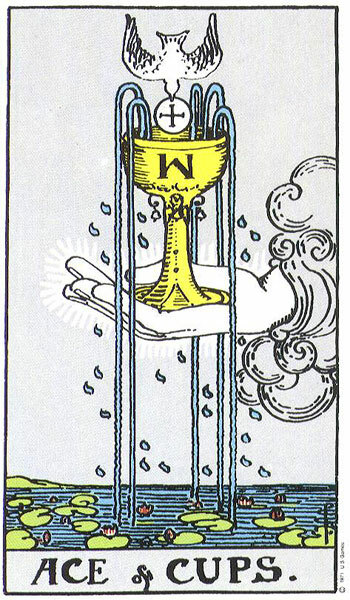 The Page of Cups is very appropriate. Card 1 – The Origins of The Relationship (How it All Started) – When they were young and in school together. They grew up in the same village. She has fond memories of him from the past. 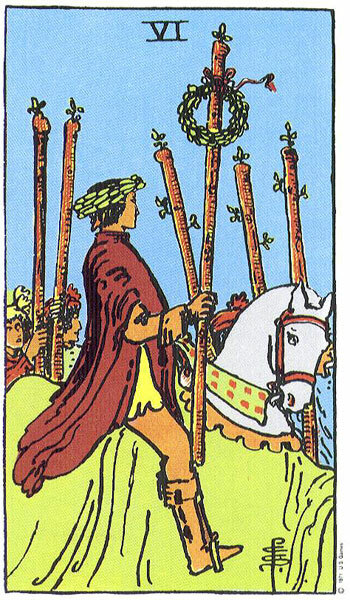 Card 2 – Where Relationship is Coming From (Immediate Past) – Johnny has just returned home from being in college overseas. She says he only has a bit of his old accent left which is quite cute. 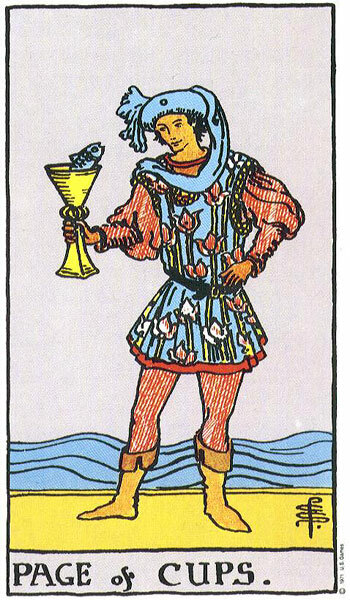 Card 3 – Where The Relationship is at Present – She sees him as being something special and different. He has a very confident air about him which she is drawn to. He was always very popular and had loads of friends. She finds him very exciting right now. 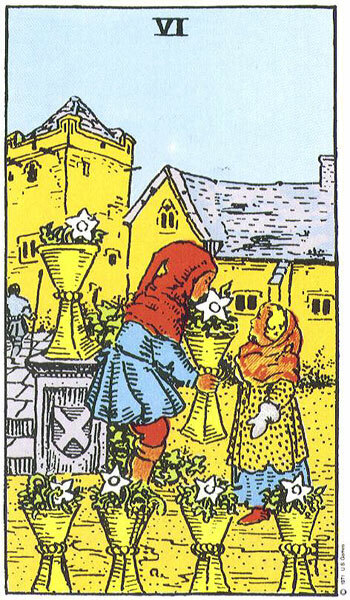 Card 4 – Where The Relationship is heading in the Near Future – She is entertaining hopes of something blossoming out of their meeting for a drink. Why would he ask her out if he wasn’t interested in her? She herself is feeling all fluttery inside just thinking about him. She is hoping for the start of a lovely romance. Card 5 – How The Relationship Ultimately Evolves – She already sees them as a couple and possibly with a future ahead of them. She is very keen and she thinks Johnny might be Mr Right. She believes there is a mutual attraction. All in all The Querant sees a fairytale ending. Her Cards are very straight forward. Very much wishful thinking Cards. 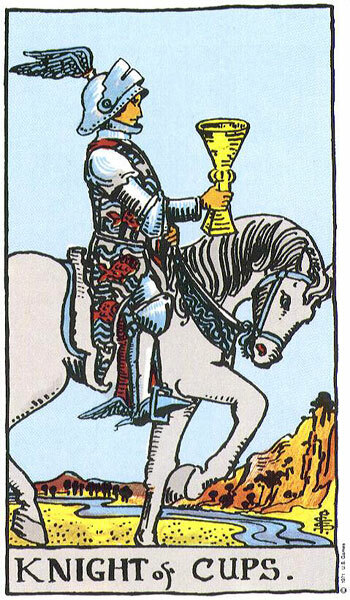 She chose The Knight of Cups for Johnny to complement her Page of Cups. She see him as a Knight in Shining Armour, very handsome and very romantic. 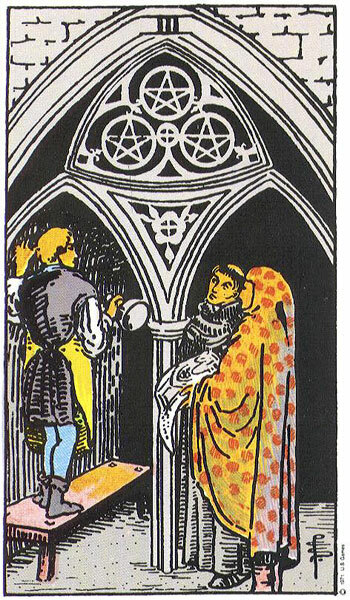 Card 1 – The Origins of The Relationship (How it All Started) – The connection from his side is group related, from school days. Simple as that. 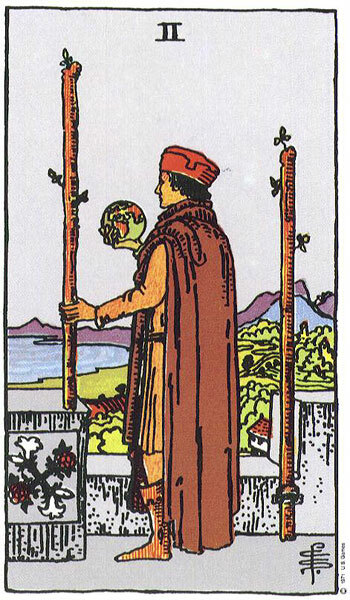 Card 2 – Where Relationship is Coming From (Immediate Past) – He has just flown home from overseas and is treating this time as a holiday. He is looking for fun and lots of activity. He may also be looking for a little Holiday romance. He is in good form, full of energy, and wants to make the most of his holiday. 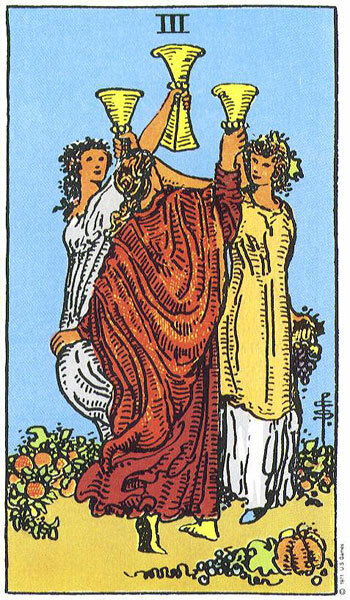 Card 3 – Where The Relationship is at Present – Friends. An old friend and exactly as he asked, meeting Querant for a drink. There may be others invited too and not the cosy drink the Querant is expecting. He may also plan to ask other women out on their own for a drink. She is not the only one interested in him. He sees it as a get together to catch up with friends and do some socialising. 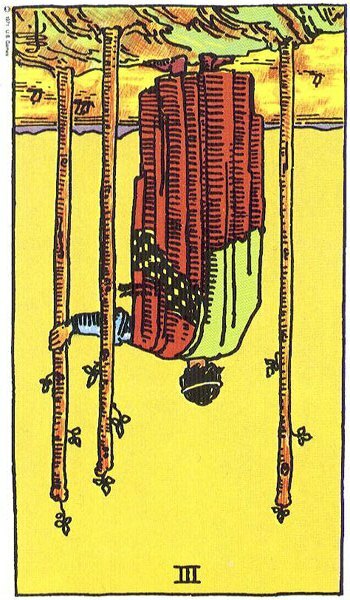 Card 4 – Where The Relationship is heading in the Near Future – He is in two minds about what he wants to do but I do not think his plans involve him staying at home or moving back home. I think he finds it all too small and in the past now. His life is different from hers and he has seen more of the world than she has. As much as he is enjoying his holiday at home visiting family and friends, I believe he would find it boring otherwise. 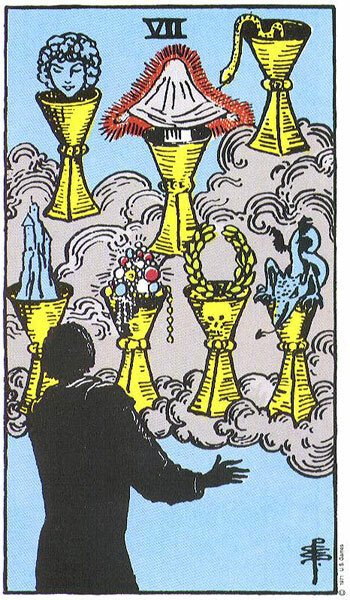 The Seven of Cups again suggests he has not made up his mind about anything. He has several options open to him and he is examining all. He also may have his pick of several romantic partners to spend time with on his holidays. I don’t think he would be happy if he stayed. I believe he will fly out as soon as his holiday is over. I do not think his plans include the Querant. 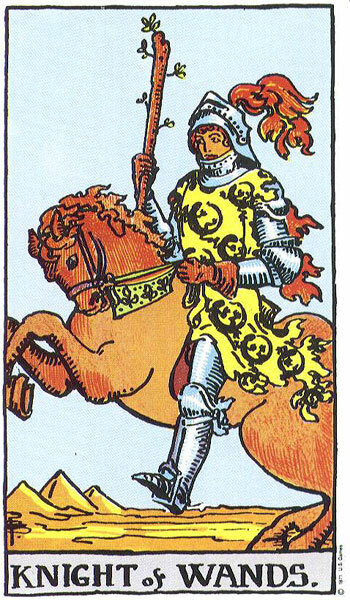 Card 5 – How The Relationship Ultimately Evolves – The Knight of Wands. 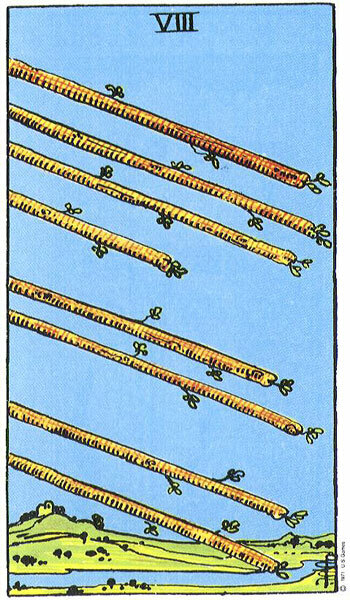 This connects to The Two of Wands. Not one to commit to a long-term relationship too easily. He is restless and sees the World as his Oyster and a place that he just has to explore. He is certainly not going to settle down too soon or stay in one place for very long. There is a good chance he plans to travel. Because he is The Knight of Wands he may very well have a holiday fling with her without realising that he would be setting the Querant up for heartbreak. If she just wanted a good time then that would be fine and he would be great fun to have around. 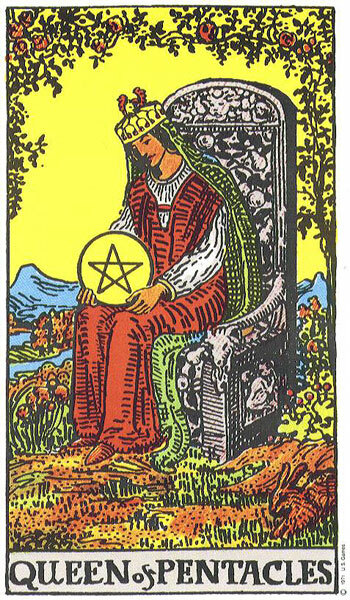 However, with The Queen of Pentacles appearing as the extra card I have mixed feelings about her presence. 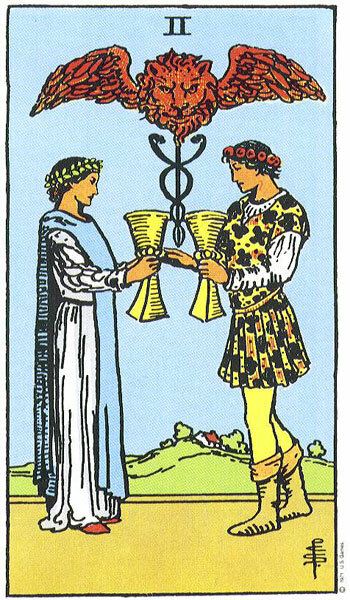 The Querant chose The Page of Cups as her Significator, but does Johnny see her as much older than him in her ways? Too settled and not very adventurous? Does he think her too practical and sensible which would not mix well with his impulsive and sometimes outlandish behaviour? Does he see her as someone who would want to try to change him? Then again, it may be the influence of his own mother coming in. 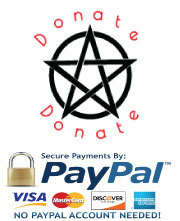 The Queen of Pentacles would be very ambitious for her son and may have big plans for him. The Querant may not fit in with her plans or be the type of woman she wants for her son. There may be an issue there. All in all, if the Querant could try to still her beating heart for long enough to just casually meet him for a drink then she may enjoy herself, but if she starts batting her eyelids at him and hanging onto his arm, she may be setting herself up for massive disappointment. I tell her to just assume that there will be a group gathered for drinks, to act friendly and try not to read too much into this invitation. See how it goes.